History of FC Barcelona, or Barca as many people call them can start on October 22nd 1899 when Hans Kamper decided to place an advertisement in Los Deportes looking for people to form a soccer club. Gimnasio Sole was the first meeting place on November 29th where 11 players attended including Walter Wild, who was the very first director of FC Barcelona. Barcelona FC history shows the club starting in the regional and national cups. Newly formed Barcelona FC had a successful start competing in the Campionat de Catalunya and the Copa del Rey. 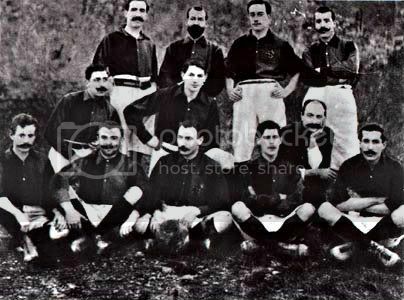 History of FC Barcelona shows them winning their first trophy in 1902 after winning Copa Macaya and also participated in the first ever Copa del Rey, losing to Bizcaya 1:2 in the final. Barcelona FC won their next trophy in 1905 when they won the Campionat de Catalunya which was the only trophy Barcelona FC had won between 1905 and 1908 leading to financial difficulty by 1908 due to no trophies won. Kamper, who originally placed an ad to form the club came to Barcelona's rescue becoming the president of the club on five separate occasions between 1908 and 1925. Kamper was also the main person in the history of FC Barcelona that ensured the club acquire its own stadium and thus generate a stable income. On March 14th 1909, Barcelona moved into the Camp de la Industria, which was a stadium that could seat 8,000 people. From 1910 to 1914 Barcelona Football Club participated in the Pyrenees Cup, which was considered as one of the finest soccer competitions of its time featuring the best teams of Languedoc, Midi, Aquitaine (Southern France), the Basque Country, and Catalonia. During this same period, Barcelona FC changed its official language from Castilian to Catalan and gradually evolved into an important symbol of Catalan identity according to the history of FC Barcelona. Hans Kamper, now known as Joan Gamper, launched a campaign to recruit more club members which resulted in 20,000 Barcelona Football Club members by 1922, also allowing the club to finance a new stadium. The club moved to Les Cortes in 1922 with initial capacity of 22,000 which was later expanded to 60,000 people capacity. First full time manager for Barcelona FC was Jack Greenwell who saw the club's fortunes begin to improve on the field. 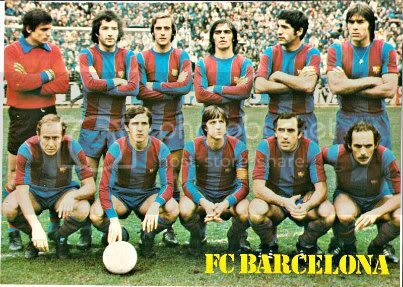 During Gamper - Hans Kamper - era FC Barcelona had won Campionat de Catalunya eleven times, Copa Del Rey six times and four Pyrenees Cups. Barcelona stadium was closed for 6 months and Gamper was forced to relinquish the clubs presidency after an incident on June 14th 1925, when the crowd in the stadium sang the Spanish national anthem and than gave ovation to God Save the King in a spontaneous protest against Miguel Primo de Riviera's dictatorship. In 1926 the directors of Barcelona publicly declared Barcelona a professional soccer team for the first time in the history of FC Barcelona. Winning the Spanish Cup in 1928 was celebrated with a poem titled "Oda a Platko". On July 30th 1930, Gamper committed suicide after a period of depression brought on by personal and financial problems. History of Barcelona FC shows the club winning the Campionat de Catalunya in 1930, 1931, 1932, 1934, 1936, and 1938 but the political conflict overshadowed the sport throughout society. One month after the Spanish Civil War began in 1936, several Barcelona FC players enlisted to fight against the military uprising. On August 6th, 1936 Josep Sunyol, the club's president and representative of a pro-independence political party was murdered by Falangist soldiers near Guadarrama. Josep Sunyol was dubbed the Martyr for Barcelona and his murder was a defining moment in the history of FC Barcelona. Barcelona Football Club squad toured Mexico and the United States in the summer of 1937 which secured the club financially but also resulted in half the team seeking asylum in Mexico and France. Barcelona came under areal bombardment on March 16th 1938 resulting in over 3,000 deaths with one of the bombs hitting the clubs offices. Few months later Catalonia came under occupation and after the Civil War, the Catalan flag was banned and soccer clubs were prohibited from using non-Spanish names. This forced the club to change its name from Barcelona Football Club to Club de Futbal Barcelona and also remove the Catalan flag from its club badge according to the history of FC Barcelona. 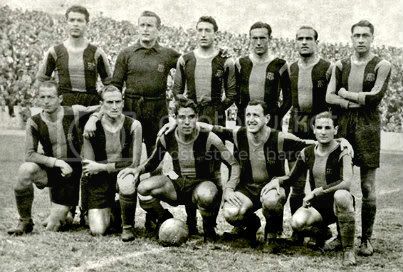 Despite the hard political time, FC Barcelona enjoyed some success during the 1940s and 1950s. Club won the La Liga title in 1943 for the first time since 1929 and than went on to win La Liga title in 1948 and 1949. In 1952 Barcelona FC won five different trophies including La Liga, Copa del Generalisimo (now Copa del Rey), Copa Latina, Copa Eva Duarte and the Copa Martini Rossi. The following year followed with another La Liga title as well as winning Copa del Generalisimo trophy again. Camp Nou Barcelona Stadium was completed in 1957 with the financial help from Barcelona supporters. Barcelona went on to win another national double in 1959 and La Liga and Inter-Cities Fairs Cup double in 1960. History of Barcelona Football Club shows them being the first club to beat Real Madrid in a European Cup competition, but they lost in the final to Benfica. With Real Madrid monopolizing La Liga during the 1960s, Barcelona FC started to see less success during this decade. Barcelona's titles for this decade included Copa del Generalisimo in 1963, the Fairs Cup in 1966 and than 1968 Copa del Generalisimo where this time Barcelona defeated Real Madrid 1:0 during the final at the Bernabeu, in front of Franco. The end of Franco's dictatorship in 1974 saw the club change its name back to Futbol Club Barcelona and changed their shirt badge to include the original letters. Record signing at the time, Johan Cruyff arrived to FC Barcelona in 1973-74 season for a world record transfer fee of £920,000 from Ajax. 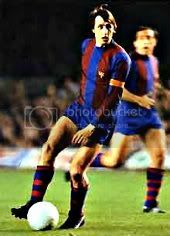 Cruyff was already an established player in Holland and it would not take him long to win over the Barcelona fans after telling the European press that he chose Barcelona over Real Madrid because he could not play for a club associated with Franco. He also chose the Catalan name Jordi to name his newborn son winning more fans all around the world. With teammates of great quality such are Juan Manuel Asensi, Carles Rexach and Hugo Sotil, Johan Cruyff helped the club win the La Liga title in his first season with the club (1973-74) also defeating Real Madrid 5:0 at the Bernabeu along the way. Johan Cruyff was named European Player of the Year in 1973 and 1974 while playing for FC Barcelona. Josep Lluis Nunez was elected president by the club members for the first time in 1978 following the Spain's transition to democracy in 1974 and the end of Franco's dictatoship. Josep Lluis Nunez made it his main objective to develop Barcelona Football Club into a world class club by giving it stability both on and off the field. On Johan Cruyff's recommendation, Nunez started La Masia as Barcelona's youth academy on October 20th 1979 according to the history of FC Barcelona. Nuneze's presidency lasted for 22 years deeply effecting the image of Barcelona, with strict policy regarding wages and players discipline which led to letting go of world class players such are Maradona, Ronaldo and Romario rather than meeting players demands from the club. On May 16th 1979, FC Barcelona celebrated their first UEFA Cup Winners Cup by beating Fortuna Dusseldorf 4:3 in a final watched by more than 30,000 traveling Barcelona fans to Basel. Diego Armando Maradona came to Barcelona Football Club on a transfer from Boca Juniors in June, 1982 for a record fee of £5 million at the time. The following season, under manager Menotti, Barcelona won Copa del Rey after beating Real Madrid in the final. Maradona's time was cut short at Barcelona as he soon left for Napoli mostly due to strict policies that Nunez enforced. Starting the 1984-85 season saw another manager change as Terry Venables was hired leading Barcelona FC to another La Liga title. The following season saw more success as Venables led Barcelona to their second European Cup final, however this time FC Barcelona lost the match on penalties to Steaua Bucuresti. Following the 1986 FIFA World Cup, English top goal scorer Gary Lineker and goalkeeper Andoni Zubizarreta signed for FC Barcelona, but the team could not achieve success while one of their best players, German Berndt Schuster was excluded from the team. This history of FC Barcelona continues with firing of Terry Venables at the beginning of 1987-88 season and his replacement was Luis Aragones. Players did not want to see Venables go and rebelled against president Nunez in an event that became known as the Hesperia Mutiny but Nunez stayed behind his decision to fire Venables. Barcelona ended the 1987-88 season with another Copa del Rey trophy beating Real Sociedad 1:0 in the final. 1988 represents an important year in the Barcelona FC history as Johan Cruyff returned to the club as manager assembling the Barcelona DREAM TEAM. Cruyff used a mix of Spanish players including Pep Guardiola, José Mari Bakero, and Txiki Begiristain while bringing in International players such are Ronald Koeman, Michael Laudrup, Romário, and Hristo Stoichkov. Under Johan Cruyff, Barcelona won four consecutive La Liga titles from 1991-94 according to the history of FC Barcelona. This Barcelona Dream Team also beat Sampdoria in 1989 Cup Winners Cup final and the 1992 European Cup final that was played at Wembley. Barcelona also won Copa del Rey in 1990, European Super Cup in 1992 and three Supercopa de Espana. Yohan Cruyff won 11 trophies as Barcelona manager becoming the club's most successful manager, until being overtaken by one of his players at the time, Pep Guardiola in 2011. Cruyff is also Barcelona FC's longest consecutive serving manager, serving 8 years before his departure in 1996 after he failed to win any trophies during his last two seasons. He was briefly replaced by Bobby Robson, who only lasted one season with the club in 1996-97 even though he signed the Brazilian Phenom Ronaldo and delivered a cup treble by winning the Copa del Rey, Cup Winners Cup and the Supercopa de Espana. Louis van Gaal was the manager Barcelona waited on, while Robson was only seen as a short term solution. Under Louis van Gaal , Barcelona FC won the UEFA Super Cup, Copa del Rey and La Liga in 1998. In 1999 Rivaldo became the fourth Barça player to be awarded European Footballer of the Year. Despite this domestic success, the failure to extend that success to the Champions League led to both Louis van Gaal and Núñez resigning in 2000. President Nunez was replaced by Joan Gaspart in 2000, and the three years he spent as club president saw Barcelona FC decline in form with different managers that came and went during these 3 years. 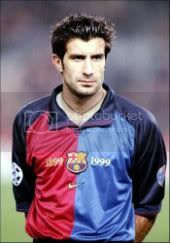 Nunez and Louis van Gaal departures were nothing compared to the departure of Luis Figo, who was the vice captain and had also become a hero to the Catalans considering him one of their own. Figo's decision to join their rival Real Madrid did not sit well with Barca fans and during his visits to Camp Nou, Figo was given an extremely hostile reception. During his first return to Barcelona stadium, a piglet's head and a full bottle of whiskey were thrown at Luis Figo from the crowd. Van Gaal was also brought in for a second term as Barcelona manager but soon after both Gaspart and Van Gaal resigned in 2003 due to poor leadership on and off the field. After disappointing three years under Gaspart, Barcelona FC bounced back with the selection of a new young president, Joan Laporta, and a young new manager, former Dutch superstar Frank Rijkaard. History of FC Barcelona shows that the new combination of international players and home grown Spanish players led to the club's return to success winning the La Liga and the Supercopa de Espana in 2004-05. 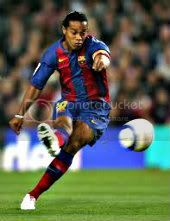 This same season, Brazilian Midfielder Ronaldinho won the FIFA Player of the Year award while wearing #10 for FC Barcelona. The following season 2005-06 Barcelona repeated the same success winning the league title and the Supercopa de Espana again, as well as winning the Champions League after beating Arsenal 2:1 in the final. This was the first club's European Cup victory in 14 years. 2006-07 season did not show much success and even though Barcelona was the favorite to win the league, they finished the season without any trophies apart from the 2006 Supercopa de Espana victory over local rivals RCD Espanyol. Barcelona FC history also shows them reaching the final in 2006 FIFA Club World Cup, but were beaten by a late goal in the final against the Brazilian side Internacional. Lack of trophies was later blamed on a feud between the player Samuel Eto'o and manager Frank Rijkaard. In the 2006-07 season, Barcelona was in the first place for the La Liga title but their decline in form in the new year caused them to be overtaken by Real Madrid on May 12th 2007. Barcelona and Real Madrid were tied on points but Barcelona lost the title on head to head superiority. This same year Barcelona FC history shows them being eliminated from the Champions League by Liverpool during the round of 16. The 2007–08 season ended without any titles, as Barça finished third in La Liga and reached Champions League semi-finals where they lost 1-0 to Manchester United. History of FC Barcelona shows the Youth manager Pep Guardiola taking over Rijkaard's duties at the conclusion of 2007-08 season. Guardiola sold superstars Ronaldinho and Deco, and started building the new Barcelona team around Xavi, Iniesta and Messi along with a new style of play, famous tiki-taka style that he had been taught during his time in the Barcelona youth teams. In his first season with the club, Guardiola managed to win the 2009 Copa del Rey, winning this competition for a record-breaking 25th time as well as winning the La Liga title after beating 6:2 their arch rivals Real Madrid during the 2008-09 season. Barcelona FC finished the season under management of Pep Guardiola by winning their third Champions League Title after beating Manchester United 2:0 in Rome. Important to mention in this Barcelona Football Club history is the fact that Barcelona FC managed to complete the first ever treble won by a Spanish team and did so under the management of Pep Guardiola in his first year with the club. Barcelona FC went on to win the 2009 Supercopa de España beating Athletic Bilbao and the 2009 UEFA Super Cup against Shakhtar Donetsk, becoming the first European Club to win both domestic and European Super Cups following a treble. In December 2009, Barcelona won the 2009 FIFA Club World Cup, once more becoming the first football club ever to accomplish the sextuple. Barcelona accomplished two new records in Spanish football in 2010 as they retained the La Liga trophy with 99 points and won the Spanish Super Cup trophy for a ninth time. After Laporta's departure from the club in June 2010, Sandro Rosell was soon elected as the new president. The elections were held on 13 June, where he got 61.35% (57,088 votes, a record) of total votes. Rosell signed David Villa from Valencia for €40 million and Javier Mascherano from Liverpool for €19 million. November 2010 should be mentioned in this Barcelona FC history as Barcelona destroyed their arch rivals Real Madrid 5:0 in the Spanish El Clásico. FC Barcelona retained the La Liga trophy in 2010-11 season, making it their third title in succession, and finishing the 2010-11 season with 96 points. Barcelona reached the 2011 Copa del Rey final, but lost 1–0 to their arch rivals Real Madrid at the Mestalla in Valencia. In May 2011, Barcelona won another Champions League Title by defeating Manchester United 3:1 in the final held at Wembley Stadium, winning their fourth European Cup. In August 2011, Barcelona youth player graduate Cesc Fàbregas was bought from Arsenal and brought back to Camp Nou. Fabregas was there to help Barcelona defend their Spanish Supercup against Real Madrid. The Supercup victory brought the total amount of official Barcelona trophies to 73, matching the number of trophies won by Real Madrid. That same month Barcelona surpassed their rival Real Madrid when they won the UEFA Super Cup after defeating porto 2:0 and securing their 74th official title. Through new style of play, Guardiola led Barcelona to 12 titles out of possible 15 in only 3 years becoming the all-time record holder of most titles won as a coach for FC Barcelona. In December 2011 Barcelona won their second FIFA Club World Cup by beating Santos 4:0 in the final with Messi scoring 2 goals, while Xavi and Iniesta added one more each. Barcelona ended the 2011-12 season unable to defend both La Liga and Champions League titles according to the history of FC Barcelona. Their Champions League run was cut short in the semi final agains European rival Chelsea taking the second game to Extra Time where Chelsea scored the winning goal knocking FC Barcelona out of the competition. Barcelona lost the La Liga title after 2:1 loss to Real Madrid in what was the deciding match for the La Liga title. 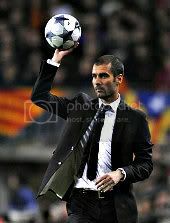 After facing criticism over his recent tactics and squad selections Josep Guardiola announced that he would step down as manager on June 30th 2012 and be succeeded by assistant Tito Vilanova. Before leaving Guardiola won another Copa del Rey title bringing the total number of titles won during his 4 years with Barcelona to 14. This inspired British director Paul Greengrass to make a documentary about FC Barcelona focusing primarily on the four years in which Guardiola guided the club to 14 trophies. The movie is expected to be finished and released by 2014 World Cup in Brazil.